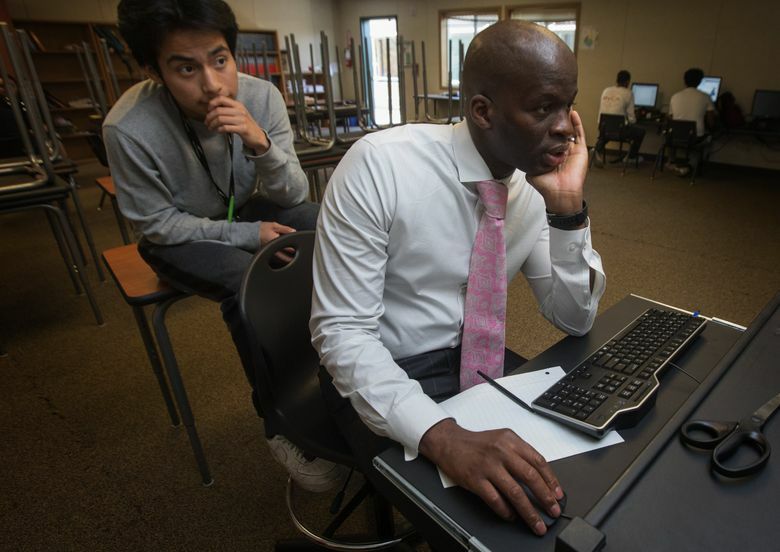 Seattle, Bellevue and Highline school districts have launched ambitious efforts to recruit more teachers who represent the backgrounds of their students. But these glimmers of hope could be blunted if challenges around retention persist. When you’re tasked with bringing more people of color to work in schools, the regular rules of recruiting don’t apply. Job fairs are a sea of white. So are most teaching colleges. And if you’ve waited until application season, you’re too late. Prompted by the diversity of their students, at least three of the Puget Sound region’s large school districts — Seattle, Bellevue and Highline — have launched ambitious efforts to recruit more classroom teachers who represent the backgrounds of their students. At Seattle Public Schools, administrators will have more money — from the new education levy — to spend on creating a pipeline of teachers from staff and students already in the district. On the Eastside, the Bellevue School District is piloting a new screening system. And in South King County, a human-resources transformation at Highline Public Schools has paved the way for a new recruiting team that scouts for talent widely, early and often. 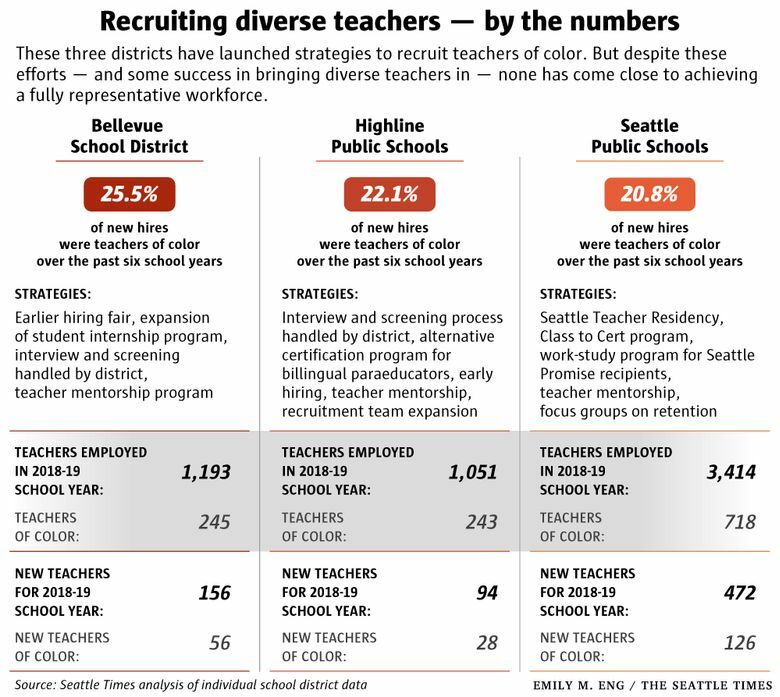 With this year’s crop of new educators, all three districts managed to hire more teachers of color than they lost between the 2012-2013 and 2017-2018 school years, according to a Seattle Times analysis. But it’s easy to show growth because the starting point was so low. Data from Bellevue and Highline show that the districts hired nearly the equivalent of their entire non-white teaching workforce since the 2012-2013 school year. Getting new teachers in is only half the battle. These glimmers of hope could be blunted if challenges around retention persist. Changing the faces who greet students is a moral imperative for Trevor Greene, an award-winning principal who three years ago joined just one other staffer in charge of recruiting for Highline’s human-resources department. He helped lead an HR overhaul, creating a seven-member workforce planning and development team incidentally comprised almost entirely of people of color. Though he grew up and attended schools on the Yakama Indian Reservation through his adolescence, all his teachers were white. 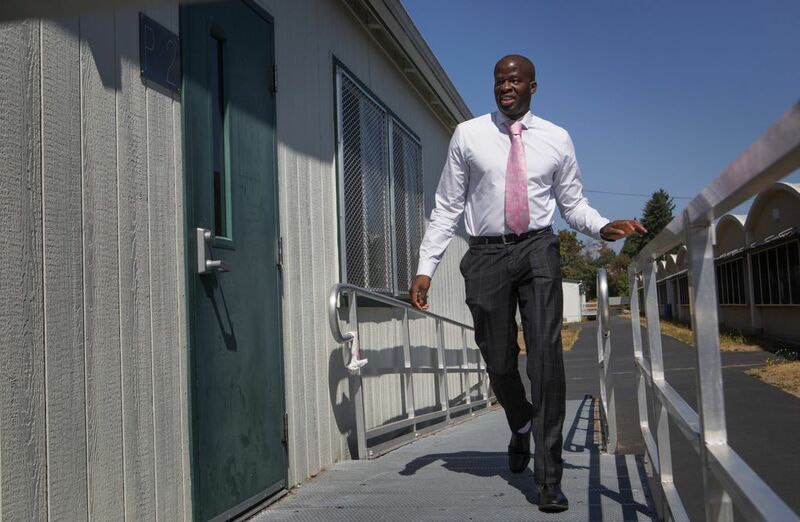 When he became a principal at Toppenish High School in Yakima County about a decade ago, Greene said he was able to set the standard high because he had “lived in the same reality as the students,” the vast majority of whom were low-income students of color. While there, his expansion of math and science opportunities coupled with increased graduation rates contributed to his becoming National High School Principal of the Year. 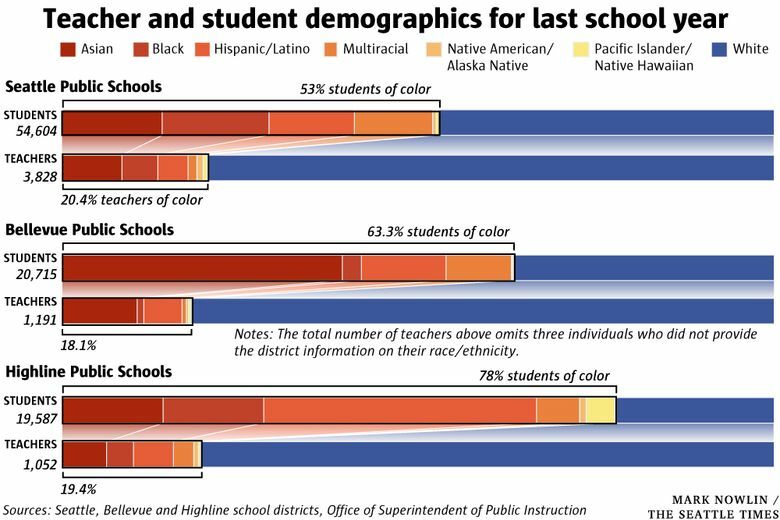 Since the 2012-2013 school year, Highline has hired 222 more teachers of color to teach its students, 78 percent of whom identify with a race other than white. The district edited the materials it handed out at job fairs and other scouting opportunities, adding more diversity to its images and marketing itself as culturally responsive. Planting the seed early — before a position is vacant — has been crucial. Darany Pen, a member of Highline’s recruitment team, starts texting and calling potential hires several months to a year before they decide to apply. That ethos extends to teachers who have already signed a contract. Though dual-language instructors are in high demand — with Highline aiming for a fully bilingual student population by 2026 — the district negotiated a contract with an incoming Korean teacher so she could start two years later, after finishing her Fulbright program in South Korea. Traditionally, hiring has been the province of schools; principals decide which teachers fill their needs. But recently, Greene said, Highline has shifted some work to the district level, where administrators seek finalists with an eye to diversity overall. It’s a change Bellevue School District adopted about four years ago, said Alexa Allman, director of employee relations. After accounting for turnover and new hires, Bellevue gained more teachers of color than any other district in the Puget Sound region between 2013 and 2018, according to a Seattle Times analysis of state data. Both Highline and Bellevue’s central-district offices have taken more control over screening candidates, to make sure more nonwhite finalists get in front of principals. Allman’s goal is to present principals with candidates who match Bellevue’s public- school population — 63 percent students of color last school year. Having more control over the interview process, Allman said, also means the district can make sure interview teams and candidates share similar backgrounds in an effort to prevent bias. Both districts have credited this change for hiring more teachers of color. Seattle Public Schools hasn’t tried shifting hiring to the central office because the contract between management and labor only allows teams based at specific schools to control who is interviewed and ultimately hired at each campus. Human resources can still suggest a diverse group of candidates, said Tim Collins, Seattle schools’ head of recruitment, retention and onboarding. By next spring, the district says all school hiring teams will have gone through implicit bias training. But Seattle, with an 80 percent white teaching staff, is far from representing its students. The district estimates about $350,000 from the city’s new $600 million-plus Families and Education Levy will fund teacher-diversity initiatives, which could mean more money to expand the district’s “Class to Cert” program, which provides scholarships for college tuition to district staff who lack state teaching licenses. Only about 80 people have graduated through Class to Cert since the program debuted a decade ago — but 70 percent of the current 20 participants are people of color. A one-time, $100,000 grant from the city helped expand the group from 15 to 20 this year. The district spends about $300,000 a year on the program, a stipulation in its labor contract. 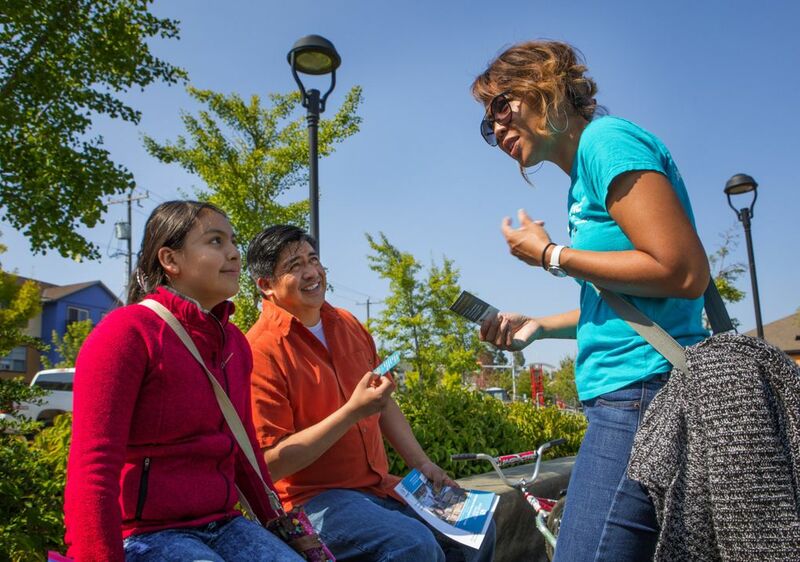 Next fall, the district plans to pilot a work-study opportunity for students enrolled in the Seattle Promise Program, which provides two years of college for free to Seattle Public Schools graduates. While attending classes, students can work as para-educators, with the goal of creating a pipeline into the Class to Cert program. The state’s Professional Educator Standards Board provided an $18,000 grant. Money from the levy could also boost the Seattle Teacher Residency. Graduates from that program commit to teaching in a high-poverty school for five years. About 40 percent of the program’s 109 graduates so far are people of color. Even as local efforts bear fruit, recruitment can only go so far. The real challenge is keeping teachers of color once they arrive. The main reason: It’s exhausting. From the time they join the workforce, they pay what some have called an “invisible tax” — a second job serving as mentors and advocates for students of color as well as a token diversity consultant. Shalini Miskelly, who is Indian American, said her background connected her to students at her former school, which catered to recent immigrants and English learners. But the additional work that bond sent her way — including service on several committees — burned her out. She said she felt ignored by colleagues and once heard a coworker call her a “colored person.” She left her job teaching at the Seattle World School last June. To keep the teachers Highline fought to attract, the district is bolstering its teacher-mentorship program, a practice that studies have shown helps retain beginning teachers. The district also deploys HR partners, who regularly check in with school leadership about staffing issues — which can include discussing career-development opportunities for teachers of color. It has also started recruiting more locally, because administrators believe that employees who have roots in the community are more likely to stay. Seattle Public Schools is beginning to address retention. Based on focus groups and exit interviews with teachers of color, most said they are leaving because of Seattle’s high cost of living, Collins, of Seattle schools, said. The district also has plans to seed informal gatherings and affinity groups for teachers of color to curb the isolation that some may feel at work. About 21 percent of the teachers who left Seattle between 2013 and 2018 were people of color, higher than Bellevue’s 15 percent and Highline’s 13 percent. The churn in Seattle, the state’s largest school district, means that there are now fewer African American and Native American teachers than there were six years ago. The nine current and former teachers of color interviewed for this story described the extra work as both a privilege and a necessity, because few others in their buildings can relate to their students the way they do. During his first year teaching, Tola Atewologun’s portable at Chief Sealth High School was a place his students could linger between classes — or late into the evening — for advice or a long chat. Some continued to visit Atewologun last summer, when the government and geography teacher would reopen his classroom to help students plan their future, like having them open an investment account or undergo entrance loan counseling for college. To his students, who call him Mr. Tola, Atewologun is someone who understands how to navigate the real world, with all its barriers and biases. A son of Nigerian immigrants with roots on the East Coast, he wears fine suits with his name stitched into the lining. He worked as a budget analyst for the federal government before he started teaching. Former student Gonzalo Cruz said Atewologun “never gave up” on him. Cruz, who is of Mexican descent, previously struggled with homelessness; he is now enrolled at University of Washington Bothell. In high school, in search of financial advice, he asked to transfer into one of Atewologun’s economics sections. Atewologun helped him set up a safe-deposit box and a post office box. “I felt safe,” said Cruz, who remembers feeling indifference from most other teachers. The information gave him a sense of security. Forging relationships with Chief Sealth students was easy, Atewologun said, because his background made him relatable. Most are students of color and children of immigrants. He keeps meticulous notes and spreadsheets on current and former students’ progress. He visits them in college or at work. Atewologun doesn’t want his students to view this work as a burden to him. But he believes there are simple ways the district could help, like more flexible hours and additional pay for off-clock mentoring work. His story also represents a small piece of the retention and teacher-representation problem that is beyond what a district human-resources department alone can resolve. When the district adjusts school staffing based on enrollment, the newest staffers are the first to be moved, as mandated by the union contract. This fall, Atewologun was forced to transfer to Roosevelt High School, a much wealthier and whiter campus on the other side of the city. In his new post, Atewologun he feels his skillset and background is less vital. He’s not doing as much mentorship work this year.